Progress in malaria control in the past decade is attributed largely to the massive scale-up of insecticide-based interventions targeting malaria-carrying mosquitoes including long lasting insecticide treated nets (LLINs) and indoor residual spraying (IRS). According to the Malaria Atlas Project, 663 million cases of malaria have been averted between 2000 and 2015 by malaria control interventions. An estimated 78% can be attributed to vector control interventions: 68% (451 million cases) were averted by LLINs and 10% (66 million cases) were averted by IRS. The emerging and rapid spread of insecticide resistance threatens the utility of LLINs and IRS. The effectiveness of these tools must be maintained if global progress against malaria is to be sustained and increased. Dengue, Zika, chikungunya and yellow fever viruses account for over 100 million of the global cases of mosquito borne diseases (CDC, 2016). Prevention relies heavily on insecticide based vector control, thus insecticide resistance in Aedes aegypti and Aedes albopictus, the primary vectors of mosquito borne viral diseases, may challenge their control. Insecticide resistance is the ability of an insect population to withstand or overcome the effects of an insecticide or insecticides. Resistance is determined by standardized insecticide susceptibility tests. The WHO criteria (for Anopheles and Aedes species) defines confirmed resistance as <90% mortality or RR>10, possible resistance is 90-97% mortality or 5-9 RR and susceptibility is 98-100% mortality or RR<5. Up-to-date information on insecticide resistance must be used to guide the deployment of insecticidal tools to ensure the right tools are used in the right place. Malaria and vector borne disease control policy makers, program managers, and researchers have called for a user-friendly approach to consolidating and visualizing up-to-date information on insecticide resistance. IR Mapper, launched in 2012, is a tool used to view results from standardized insecticide resistance tests (WHO susceptibility tests and CDC bottle assays) on Anopheles species collected from sites throughout the world. In 2016, the mapper was expanded to include insecticide resistance data on Aedes aegypti and Aedes albopictus . IR Mapper can also be used to view results from investigations of insecticide resistance mechanisms. Users are also able to view their own data from insecticide susceptibility and resistance mechanisms tests alongside existing published data. Zoom to view additional map details. Pop-up boxes for each individual point that show assay details and link to the data source (publication). Option to change between base maps and switch on/off main menus. Instructions for filling out the user data template. Download template function to download a CSV data template file. Add my data to upload the saved CSV file containing the user data or drag and drop the file on the application. Clear my data to revert to the online dataset. Note that user data are not stored or added to the database. We recognize that users may have varied browser preferences. However, for the best experience on IR Mapper, we recommend using Internet Explorer 11 and above, Firefox 28 and above, Chrome, Opera and Safari browsers. 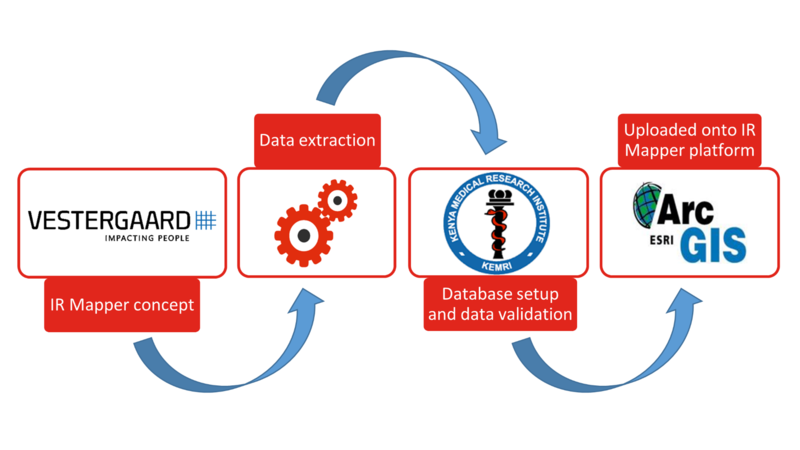 Data are extracted monthly from peer-reviewed scientific publications and other published reports including the President’s Malaria Initiative Country Insecticide Susceptibility Summaries (for Anopheles map) and VectorBase. The Aedes map includes data provided by Professor Hilary Ranson in 2016. The Plasmodium falciparum endemicity layer was provided by the Malaria Atlas Project (MAP). For more details, see Bhatt, S., Weiss, D.J., Cameron, E., Bisanzio, D., Mappin, B., Dalrymple, U., Battle, K.E., Moyes, C.L., Henry, A., Eckhoff, P.A. and Wenger, E.A., 2015. The effect of malaria control on Plasmodium falciparum in Africa between 2000 and 2015. Nature, 526(7572), pp.207-211. The Zika endemicity layer was sourced from Messina, J.P., Kraemer, M.U., Brady, O.J., Pigott, D.M., Shearer, F.M., Weiss, D.J., Golding, N., Ruktanonchai, C.W., Gething, P.W., Cohn, E. and Brownstein, J.S., 2016. Mapping global environmental suitability for Zika virus. Elife, 5, p.e15272. The dengue endemicity layer was sourced from Bhatt, S., Gething, P.W., Brady, O.J., Messina, J.P., Farlow, A.W., Moyes, C.L., Drake, J.M., Brownstein, J.S., Hoen, A.G., Sankoh, O. and Myers, M.F., 2013. The global distribution and burden of dengue. Nature, 496(7446), pp.504-507. The chikungunya endemicity layer was sourced from Nsoesie, E.O., Kraemer, M.U., Golding, N., Pigott, D.M., Brady, O.J., Moyes, C.L., Johansson, M.A., Gething, P.W., Velayudhan, R., Khan, K. and Hay, S.I., 2016. Global distribution and environmental suitability for chikungunya virus, 1952 to 2015. Euro surveillance: bulletin Europeen sur les maladies transmissibles= European communicable disease bulletin, 21(20). IR Mapper is a joint initiative. Data collection and collation is performed by Vestergaard, data proofreading is conducted by KEMRI/CDC and the interactive map platform was developed by ESRI Eastern Africa (collectively “IR Mapper”). Disclaimer: Data provided by the IR Mapper application is to the best of IR Mapper’s knowledge correct and true. However, the data has been produced by using, and in reliance on, information furnished by third parties and such information has not been independently validated, verified or confirmed by IR Mapper. Thus, IR Mapper makes no representation or warranty (express or implied) to any User of this website in relation to the data, and IR Mapper’s expressly disclaims any liability whatsoever (whether in contract, tort or otherwise) to any User. If published data appear to be missing or there are errors, kindly contact us with further information. IR Mapper www.irmapper.com (Date accessed). IR Mapper now incorporates resistance data on Aedes aegypti and Ae. albopictus in the Aedes map (2017).